Let’s face it, most people don’t exactly enjoy going to the dentist. In fact, 75% of adults have a dental phobia or fear of dentists. Although it is hard to estimate the number of children with dental fear, it appears that many adults learn their fear from experiences during their younger years. In addition, children have a much harder time facing their fears to accomplish their dental treatment. As a result, more and more patients (and parents) are requesting to be asleep for dental work. To be asleep for dental work is another way of saying you want general anesthesia for dental care. Many dentists may offer sedation or sleep dentistry. Some even market it as being asleep. However, the use of either oral or IV sedatives really shouldn’t put you to sleep. That of course, doesn’t make these techniques wrong, but you just might remember some, or even all, of your procedure. This is often ok for adults, but it often fails in children. Children and patients with severe dental phobia typically need more than just sedation. That option is general anesthesia, which is what is performed for the majority of medical procedures either at the hospital or ambulatory surgery center. 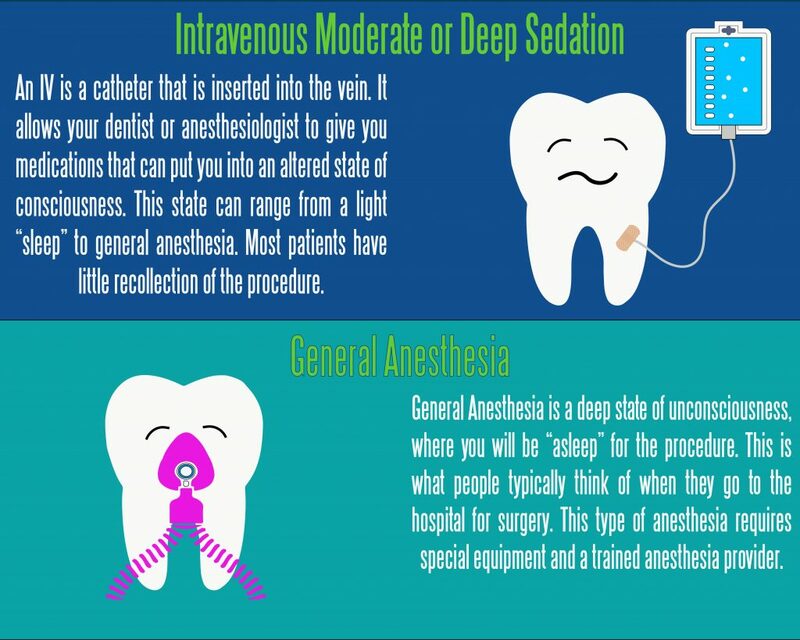 What is General Anesthesia for Dental Care? General anesthesia is a state of unconsciousness produced by an anesthesiologist where the patient does not remember or feel anything during the procedure. In addition, the patient remains still and does not move. The anesthesiologist must monitor the patient continually and ensure that the patient remains safe until the patient emerges from anesthesia. Due to the complexity of this type of care, the office should have special monitoring and emergency equipment to ensure patient safety. In fact, there are national standards that require additional gas equipment and alarms when dental offices provide general anesthesia. Such offices are said to be NFPA 99 Category 1 compliant. First, the patient and their family should meet with both the dentist and the anesthesiologist for a consultation prior to the day of surgery. During this consultation, the dentist will decide if the treatment requires general anesthesia. If it does, then the anesthesiologist will discuss the option of general anesthesia for dental care and ensure that you are healthy enough to have this performed at a Category 1 compliant office. Not all patients are good candidates for general anesthesia in an office. During the consultation, the anesthesiologist will also review the risks and benefits of anesthesia, answer all your questions, and review pre and post operative instructions. One of these instructions is the last time you can eat or drink before your surgery appointment. You should also get a chance to see the facility itself. On the day of surgery, your anesthesiologist will again check to make sure that you are healthy and ready for anesthesia that day. All of your questions will be answered by the anesthesiologist. General anesthesia can then be started in one of several ways – by IV, by breathing through a mask, or by an injection (much like a vaccine). Once asleep, an IV is placed (if not already placed) and an endotracheal tube is inserted. The endotracheal tube works like a snorkel, allowing the patient to breath and protecting the airway when the dental work is being done. Why use General Anesthesia for Dental Care? Previous Previous post: Dental Cavities in Children – How Common Is It?